Golden is meant for girls with golden skin tones. If you have green veins on your wrist, look better in gold jewelry, or wear Warm Gold or Buttery Gold in our powder foundations this undertone family is for you. Sample sizes come in a 2-gram pod. Full size is a 12 gram twist-up tube. 100% natural, Vegan, and Gluten Free. This is the only foundation I have ever used. I use this as a concealer on my red areas. The yellow helps conceal my blemishes. Since you get to choose from so many shades, once you find your ideal match, application of this foundation is imperceptible and the result is a natural look. The sample sizes are perfect to carry in your purse for touch ups or for when you are traveling. I love silk naturals. This is a godsend for people with sensitive skin. I swear this is the only foundation in fifteen years that has not broken me out and/or irritated my skin. I have tried organic and traditional foundations liquid/cream/powder. Nothing compares to this. WOW!! I need moisturising serum and a rich moisturiser underneath the foundation. My skin is not too dry but dehydrated and "eats" everything I put on it. At first I tried to put the foundation on with my fingers. Definitely fine finish. Went to damp beautyblender instead and FLAWLESS finish. I prefer light cover but I think it can be built up to medium. I will never use another foundation!! Love this! I ordered three samples the G40, 50, and 60. They all actually work on me but I think so far the G50 may be my best match. I love how natural this looks. I start with some of the awesome sauce serum, then massage in some coconut oil and then this foundation and my skin glows. I prefer a dewy look and this is it. So pretty! Thank you Karen! I LOVE this foundation!!! I'm Hispanic with olive/yellow undertones and oily t-zone. I always have trouble finding the fight shade. 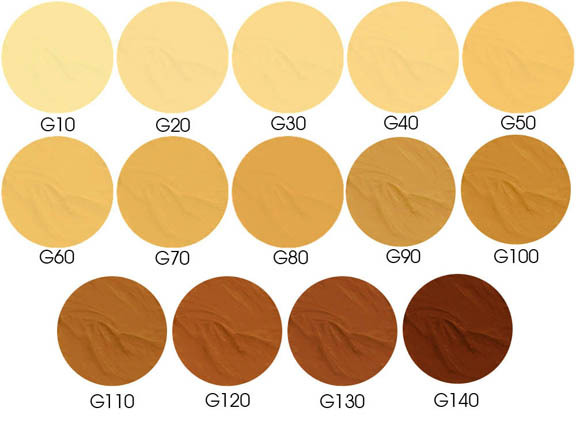 I use shades G30-G50 depending on the season. I love that it's creamy but lasts a long time. Only downside is that I break out a bit when I wear it alone so I have to dust a mineral foundation first then put the cream foundation on. Great coverage (light with a beauty blender, heavier with a brush). It's my holy grail!!! I recently went cruelty free and have been struggling to find a decent foundation to replace my L'oreal stuff. I'm half Asian and have ended up with extremely fair, yellow toned skin, which is very difficult to find a color match for. I ordered the sample sizes of the G10 and G20, just to try them out. Listen when they say the fair shades are FAIR. I'm super fair and the G10 made me look sick. G20 is an absolutely perfect match though. I am NC15 and my shade ended up being G20. I really loved the color (it is very yellow) and the packaging of the sample. I can put it in my z palette, which is nice because I have limited storage and travel a lot. I like being able to keep everything in one spot. I had some difficulty applying with a sponge, but it works great with fingers. It was very sheer and natural, yet buildable to cover any blemishes. As another reviewer mentioned, it does cling to my dry patches. Although, I found it no worse than other liquid foundations that are recommended for dry skin -- I definitely have to super moisturize/exfoliate to wear it. I'm new to non toxic foundations so I wanted to leave a review after trying this foundation. I'm so impressed and so happy with the results! I've even been told this foundation looks better on me than any other conventional foundation I've worn. I have super oily skin and this even holds up better on my skin than matte foundation do. The shades do run pretty light. I thought I would be a G30 but ended up being a G50. This foundation is seriously the best!! I have always had so much trouble finding the right shade for my skin. I really think this might be the only one out there for me. That's not all. It covers well, feels good on the skin, and looks great. Stop what you are doing and give this a try now! Grab some samples, find your shade, and tell your friends! This is a great cream foundation. I have struggled to find a product that was non-toxic but did not have essential oils or fragrances that irritate my skin. The ingredient list for this product is excellent. I have found so many natural non-toxic make-up lines use potentially irritating ingredients like lavender oil or orange peel oil. I tried Au Naturales cream foundation, it was good in terms of colour match but my skin reacted to the essential oils in the product. I also tried Kjaer Weis's cream foundation. I did not react to that product, but found it hard to blend and it seemed better for oily skin rather than for my dry skin. I first tried G60 but the colours run a bit light. G70 is perfect for me! I highly recommend this product for someone who has normal to dry skin as it is beautifully creamy. I use a touch of tinted blur powder to set the foundation but only in the summer. I also want to acknowledge the excellent customer service by Silk Naturals and a special shout out to Karen. I had some products go astray in the mailing process and Karen replaced the missing items. Her prompt and excellent customer service made my day! I am a happy Silk Naturals customer! I think this is a really great product, but it just didn't work for my skin type. I have insanely dry skin and struggle with eczema, and the formulation didn't mesh well with my skin issues. It does have a really nice and smooth finish and great coverage, but it clings to my dry patches and doesn't apply well if you have to wear heavy moisturizers all the time for winter weather. Just to clarify, my winter moisture routine is lotion, topped by shea butter, topped by an oil, topped by eucerin cream. And , I have to do this 2 times a day or my skin is raw and peeling. So, if you don't have issues like this, I think this is really a fantastic product for the price and the quality of the ingredients. Definitely give it a try! I really loveReview by Vivian R.
I really love this foundation! I was quite happy with SN's original loose foundation but this gives a softer, dewier look. I wish the coverage was a tiny bit heavier but it's build-able and natural looking. Love it. SmoothReview by Magdalena U. Love it. Smooth application and great coverage. I apply it with fingers and set it with a powder, that way it lasts pretty long. These golden shades are suitable for both yellow and yellow/olive undetones. I have hadReview by kayla r.
I have had a hard time finding a natural foundation that covered well, was light enough for my pale skin and didn't feel too heavy. I think this one works...it's medium coverage. It feels pretty light on my skin and so far hasn't made me breakout. I first ordered sample sizes (they are enough for a lot of uses) and I just ordered the full size in G10. This is byReview by Joana V.
This is by far one of the most weightless (or lightweight) foundations I've ever tried, and my history with foundations include Chanel, Missha, Atom, and drugstore. The HD Cream Foundation is a sheer to medium coverage. Unfortunately this doesn't completely cover blemishes, but I personally like the no-makeup, healthy skin look, which makes this a perfect addition to my everyday makeup routine. This doesn't accentuate my dry patches, and for the record, I have normal to dry skin that leans towards dry in the winter season. Also, I applied this with my fingers and used a sponge, the Beauty Blender to be specific, to make it blend seamlessly. My skin needsReview by Brenda J. My skin needs extra help in the winter month. With the Cloud powder and layering it before and a light after application after my skin look great all day long. I got a almost full coverage with this way of applying it.